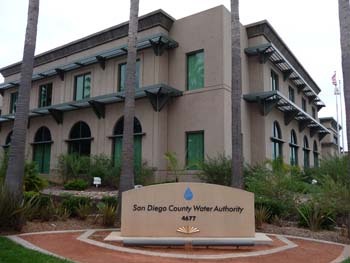 The San Diego County Water Authority sustains a $231 billion regional economy and the quality of life for 3.3 million residents through a multi-decade water supply diversification plan, major infrastructure investments and forward-thinking policies that promote fiscal and environmental responsibility. A public agency created in 1944, the Water Authority delivers a safe and reliable wholesale water supply at an affordable cost to 24 retail water agencies, including cities, special districts and a military base. Historically, the Water Authority depended almost exclusively on water supplies imported from the Colorado River and Northern California by the Metropolitan Water District of Southern California. That changed in 2003 with the start of the largest farm-to-urban water conservation and transfer agreement in the nation with the Imperial Irrigation District, which now accounts for about one-third of San Diego County’s water supply. In late 2015, the Water Authority added a historic new water source to to its portfolio with the completion of the nation’s largest seawater desalination plant in Carlsbad. Today, the Water Authority and its member agencies have identified potable reuse of recycled water as the next major source of local water supply, while continuing to aggressively promote water conservation as a civic responsibility. The Water Authority is governed by a 36-member Board of Directors representing the 24 member agencies. A member of the San Diego County Board of Supervisors also serves as a non-voting member to the Water Authority Board. The agency operates under the County Water Authority Act in the California State Water Code. The Water Authority’s Administrative Code contains regulations adopted by the Water Authority's Board to govern agency property, contracts, business, operations and other matters.